Founded in 1985 as a sanctuary to impel peace, nourish the soul, and foster goodwill among all mankind, the City of Angels Church of Religious Science began as a seed planted in the hearts of its founders, the late Dr. O.C. Smith and his wife, Dr. Robbie Gholson Smith. It has since blossomed into a force for self-awareness in Greater Los Angeles and beyond, enriching the lives of over 5,000 members and unifying those from all backgrounds, faiths, and stages of life who seek the truth within themselves, each other, and our world. Long before they met, married, and founded the church of their dreams, O.C. Smith and Robbie Gholson Smith were individuals searching for the truth in their lives. Ocie Lee Smith, though raised in a churchgoing southern family, felt that religion for him was by-the-numbers, a dance without feeling. Too often, he felt pressured to seek solace in faith outside himself, in answers he never could hope to grasp. Whether in the form of different religious texts, different preachers, or different denominations, the only thing that resonated with him was his growing belief that one could look to the external forever and never be sated, or one could learn to look inward for peace and finally quench the soul’s thirst. Meanwhile, Robbie Gholson Smith prided herself on her practicality, determination, and her inherent love of teaching. With a budding career as an instructor and administrator, she believed that within all of us could be found the means to achieve our goals. All anyone required was guidance. 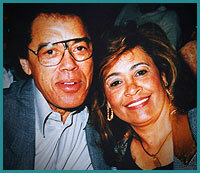 Smith and Gholson met in Los Angeles, fell in love, and married in 1976. Their journey towards creating the Church leaped forward when they attended a lecture by Dr. Joseph Murphy. He spoke of God in a metaphysical sense, a presence within everything, indistinguishable yet separate, that united all life and furnished answers for our questions right within us. Dr. Murphy stoked the fires that had burned for so long in the souls of O.C. and Robbie, and soon, the couple consumed all they could on religious science. So inspired was O.C. that he dedicated his life to becoming a minister. He and Robbie were certain that their calling was to establish a haven where their respective talents, including O.C.’s flair for presentation, world-renown jazz singing and musicianship, and warmth among people, in conjunction with Robbie’s tenacity, fastidiousness, and leadership, could best serve their religious beliefs and make them accessible to all who wished to learn. In 1985, Smith became the Reverend O.C. Smith. Tapping their savings and the income O.C. earned from his jazz performances, they ushered in the City of Angels Church of Religious Science in its initial location on Aviation Boulevard, Los Angeles. Thanks to Robbie’s invigorating interior design and O.C.’s magnetic personality, the Church became a popular locale among everyone, from genuine spiritual seekers to good friends to curious passersby. At its heart, their religion opened eyes to the good in the universe, the good in each individual, and the good in us as a collective. Reverend Smith urged his listeners to tap into the divine nature within every man and woman, to see the good in the world and in our lives, and to project that into ourselves and those we touch. The world is a great place, and through looking inward and radiating our love outward, O.C. and Robbie believed that we could make the world even greater. As O.C. once said, “Praying doesn’t affect a God out there; it affects the person who is doing the praying.” We all are divine beings in some way, and realizing this would allow us to live up to our potential and aid the world in doing so as well. Realizing that their growing membership required more than a weekly service, and given requests for further teaching, youth programs, and so on, Dr. O.C. and Robbie knew they had outgrown their surroundings. 1996 saw the rebirth of the Church at its Grosvenor Boulevard location in western Los Angeles. With a seating capacity of over 1,200 looking onto a sizeable stage with cascading waterfalls, and with generous space for offices and classrooms, a bookstore, and a kitchen, this was the ideal setting. And indeed, the ministry, its membership, and its message blossomed and proliferated. In November 2001, Reverend Smith made his transition out of this life to join the Almighty Spirit in whole. But the City of Angels Church of Religious Science continues on, enriched because of the time Dr. O.C. Smith gave and evolving daily to guide its current and future members. To that effect, Reverend Robbie, having been ordained, was appointed Senior Minister and CEO of City of Angels Church, a role she cherishes and executes with grace and diligence. In 2007, given the strong membership base and ease and access of the internet, Dr. Robbie opted to shift the City of Angels Church of Religious Science online, commissioning a website and a virtual ministry, which continues today. Other ventures the Church has overseen have included seminar cruises, ministerial school, motivational classes led by well-known area reverends, a golf tournament, jazz festivals with celebrity musicians, auctions, concerts, and multiple ongoing charity efforts within the community. The Church also established the City of Angels Children’s Charities and Scholarship Foundation in 1988, assisting worthy young men and women in achieving their educational goals.